On 10 Feb 2003, the Nelson-Shuzenji Friendship Society presented their plans for a series of small Japanese Gardens linked by Open Access Corridors to City of Nelson Council. On 21 Feb 2003, the City of Nelson sent a letter to our Nelson-Shuzenji Friendship Society. The letter from the City was in response to the presentation made to City Council where the vision for a series of Japanese Friendship Gardens linked by Open Access Corridors was disclosed. "Thank you for making the presentation to Council on your Society's plans for the Shuzenji Garden Project. Nelson City Council agreed that they support your plans in principle as presented. Once your planning process has reached an appropriate stage, Council asks that you bring them back for their final approval." Bob Adams, Bernie Zimmer, Bruce Walgren, Jon Barber and Dave Cherry, all of whom were given specific responsibilities and according to Jim did great jobs. Jim and his committee had also met with local community groups such as Earth Matters and Nelson's Own Kootenay Kiltie Pipe Band, and the committee were looking forward to forming more strategic alliances. On Wednesday 12 March 2003, Mr. Hiro Okusa, Japanese Garden Specialist of JAPONICA Landscaping & Nurseries, a firm specializing in Japanese gardens, fish ponds and waterfalls, visited Nelson to meet with Jim Sawada, the Chair of the Society's Garden Committee and present his vision for the Cottonwood Falls Park Japanese Garden site. Mr. Okusa had already begun site plan sketches (at left) for the Cottonwood Falls Park location. His initial concepts were received with great enthusiasm by the Garden Committee. On 13 March 2003, Hiro and Jim visited the City of Nelson Plant Nursery and was shown around by fellow Garden Committee member Jon Barber. 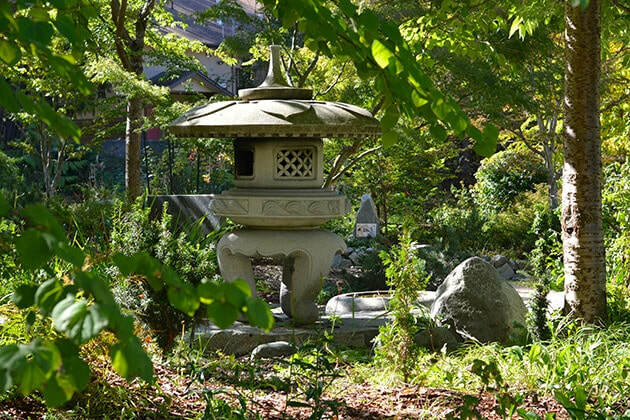 The Nelson-Shuzenji Friendship Society planned to build a series of small Japanese Gardens at locations throughout our community, and link them with Open Access Corridors. Initial Garden sites were planned ​for Cottonwood Falls Park, a site on the West Waterfront, and the Shuzenji Gazebo beside the Prestige Inn. The Open Access Corridors will leverage existing and future pathways being built by the West Waterfront Pathway Committee. On 30 April 2003 and 1 May 2003, Hiro Okusa, the Japanese garden designer for the Nelson-Shuzenji Friendship Gardens Project, visited Shuzenji Japan. On the morning of his first day, he met Shuzenji Mayor Bob Oshiro (below left). Throughout the rest of the day, Mr. Okusa was guided by Shuzenji City Offical Mr. Eiichi Oshiro around Shuzenji and Niji-no-Sato Park. Mr. Okusa also visited a Nou Stage at a Shuzenji Ryokkan. On the following day, Ms. Atsumi Kurosu (Nelson Friendship Society President) and Mr. E. Oshiro took Mr. Okusa to Daruma Mountain to see a view of Mt. Fuji with Suruga Bay underneath. The rest of the day was then spent at a small village on the coast called Heda-mura. During the visit, Mr. Okusa was able to share the vision for our Nelson-Shuzenji Friendship Garden with our friends in Japan. Everyone is very excited and supportive, and we look forward to using this project to help strengthen the ties among our communities. ​Work on the Shuzenji Friendship Garden at Cottonwood Falls was accomplished in 2003. In a series of well-coordinated "volunteer work parties" Garden Project Chair, Jim Sawada, completed most of the major landscaping and the first set of plantings. The last "work party" took place at the end of August and included help from both Vancouver and Calgary! When Hiro Okusa visited Shuzenji in May 2003,the response he received was extremely positive, but he left knowing the importance of acting quickly. "They want to help us, but it will be more difficult for them when they are no longer just the City of Shuzenji", says Garden Project Chair, Jim Sawada. By September the City of Shuzenji would be meeting to discuss how they could contribute to the project. Jim Sawada explained further that support from our community for the Shuzenji Friendship Garden had been overwhelming. "Lots of people say they are really pleased. And, we have also had lots of volunteer and community support". Just a little over a week earlier, Star Transfer had volunteered to drive down to Vancouver to pickup and deliver twenty Japanese Maple trees that had been purchased from a nursery that was closing shop. The massive stones that create such features as rock staircases, the stone benches, and path borders were donated by MacNally Excavating. On August 29th, after a few days of intense work, Hiro Okusa and his team of volunteers completed the first set of plantings. At that time, there were about 20 Japanese Maples (momiji) and 20 Cherry trees (sakura) (6 feet tall) were purchased in Vancouver and paid for by donations by many individuals in Nelson and elsewhere. As well, many asters, a few magnolia bushes and yew trees were planted in the new Japanese Friendship Garden. "The City of Nelson has been extremely helpful. They provided many of the plants that we now have in the garden", says Jim Sawada. Jim was most grateful to the local media at the time for their contributions to the garden project: Nelson Daily News, the Express and the Radio station. Lists of supporter, corporate and individual donors as of 2003 are shown below. "Everyones effort last week was incredible", said Jim Sawada. In addition to volunteers from the Friendship Society, work party included help from designer Hiro Okusa, and two of his associates from Calgary-based Fuzei Gardens (below right). "We were really lucky to have Edzard Teubert and Yuki Matsunaga volunteer their expertise" said Jim Sawada. Edzard and Yuki both work for a prominent Japanese garden design company in Calgary, and traveled to Nelson so that they could work with Hiro Okusa. "We provided them both wth homestay accommodation and entertained them while they were here, but they did a "ton" of work during their three day visit. They taught us a lot too", added John Pritchard. Edzard Teubert explained: "Hiro Okusa is one of the top Japanese garden designers in North America. I take advantage of every opportunity I can to work with him." Hiro Okusa also recognized the value of skilled helpers and sharing knowledge. At one point during the work party, Edzard was showing Society member Ben Portz techniques for constructing Japanese-style loose stone walls. Hiro walked by and seeing Ben and Edzard, patted John Pritchard on the back and with a big grin said, "Free Seminar...". Ben Portz, a new Society member, who had just moved to Nelson to attend Selkirk College, was really pleased with how the Friendship Garden was coming together. "This is great. We are building something for the whole community to enjoy." When asked about people using the park and garden, John Pritchard replied, "well, we are still doing construction so people will need to be careful. But, as you can see, people are already coming out to enjoy the new surroundings. Our Society sees this area as belonging to the entire community. We are just trying to realize a vision for how everyone can share this special space". When asked about what kinds of activities will happen in the park, John smiled and replied, "The Garden belongs to the Community. Our Community will determine how they enjoy it. Personally, I am confident that our guests will be sensitive to their fellow visitors, and show respect toward the garden. While we welcome folks to sit on rock benches and enjoy the surroundings, it would be helpful if everyone stayed on established trails to minimize disturbance to the new bedding areas and the surrounding slopes." Jim Sawada commented on the biggest need facing the Nelson Izushi Friendship Society. "We need money. We have been very fortunate to have the support of the community through volunteers and material donations, but we still have bills to pay. The speed of our work depends on the money we have available." The Society needs funds to purchase materials such as gravel, crushed rock, topsoil, plants, signage, irrigation, and a new bridge. The total cost of the project had been estimated at $60,000-$70,000cdn, but Jim Sawada was optimistic about the progress so far. "We have been ahead of schedule and under budget so far, but there is always more to do and it can add up fast." RHC McDonald Insurance Brokers Ltd.